RSS readers make reading a bliss. They pull the most relevant articles into a clean, good-looking interface that is easy to sort, read, favorite, share and download for offline reading. If you do a lot of reading for work, you need a good RSS reader. Without further ado, here are some of the RSS readers worth checking out for geeks and novice users alike. 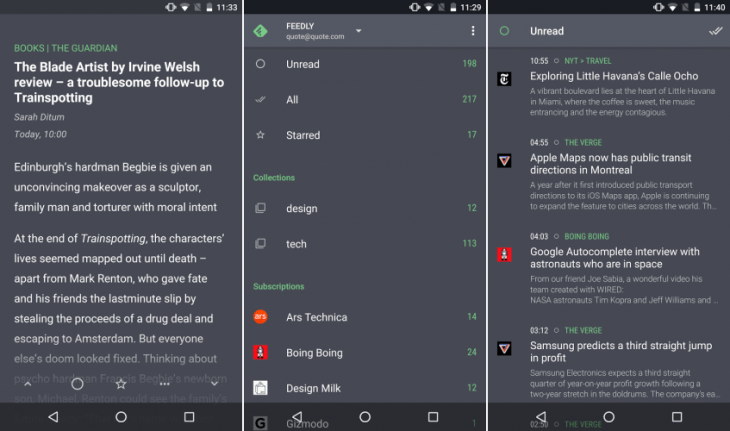 A tried and true RSS reader, Feedly is a go-to option for anyone. It’s constantly updated, is feature-rich and satisfies pretty much every request you might have. It comes in free and paid version, which is $5 per month. The paid version grants you full feed search option, faster search, intergation with automation services. It is also cross-platform, and has a comfy web app and syncs with Google, which makes it a no-brainer of a choice. I would recommend it for beginners. 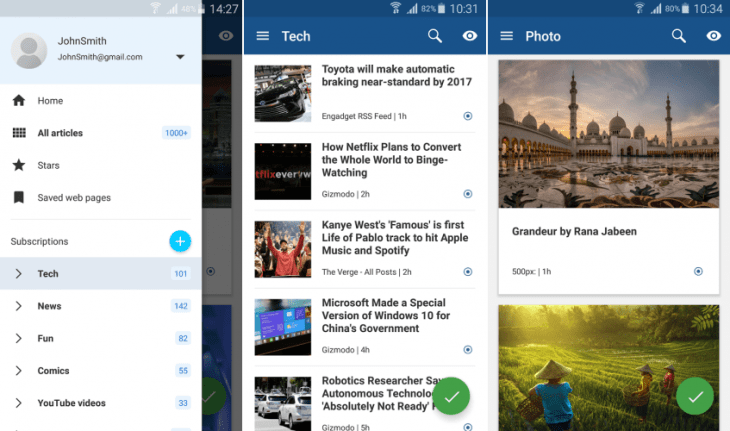 It makes it easy to share articles to social networks and other apps, and is perhaps the best alternative to the long-gone Google reader. If the Flipboard-style flip view seems confusing, just go to settings and switch to a compact view. Android users, if you ever try gReader Pro, you will never want to go back to anything else. 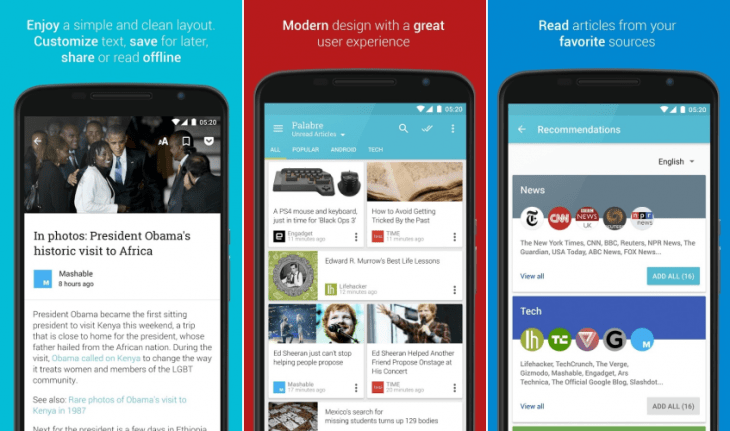 gReader Pro is simply the best RSS Reader on Android, in my humble opinion. You can, of course, try its free version, but it’s ad-supported, and the full-screen ads tend to ruin the impression somehow. However, if you look past the ads, you will find a rock-solid RSS reader apt for geeks. Or newbies. It has several themes, and a night mode for easy reading at night. There are plenty of little features that make it easy to customize your reading experience, the look of your feed, the sharing, the tagging and the like. Most importantly, it supports Feedly, The Old Reader or lets you create feeds locally, without the cloud sync. I am a great fan of the latter because I like to keep my reading to myself. The list of features is miles-long, so most prominent are: double-tap to turn on Readability view, create shortcuts for the features you use most, customize sharing options. 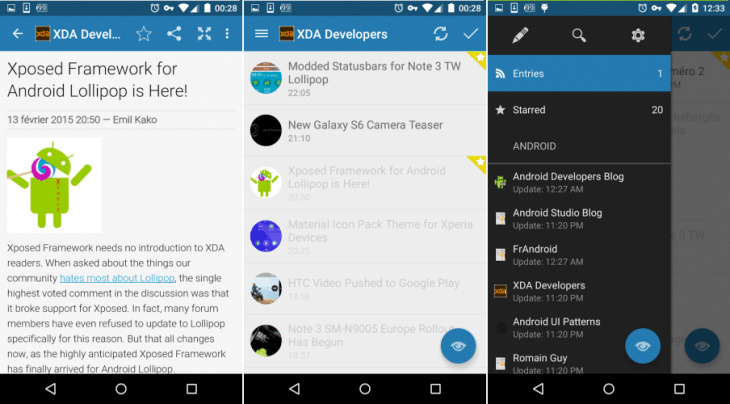 gReader has many widgets, supports podcats, and even voice reading in Pro version. Backup, sync, offline reading, mark read on scroll and many more will take some time to master, but it’s worth the hassle. Oh, and yes, it’s updated. For a while it seemed dormant, but it’s back on rails, and more awesome than ever. Quite fresh on the market (if compared to other behemoths), Palabre features a beautiful rendition of Material Design, and has a few aces up its sleeve. It’s a polished app and provides a solid reading experience. The free app has ads while $2.50 removes them. It’s a Feedly reader, and RSS reader that features offline reading, dark theme, sync, magazine layout, widget. An optional extension will grant you support for The Old Reader, Twitter, Inoreader and even Flickr. And it has an Android Wear app if you can read off that thing. Flym is a veteran, open source and free, no ads. If you know what open source and no ads means to your privacy, you will know what I mean. It also has a simplistic design, and does not sync. But it’s a decent RSS reader that lets you import your Feedly subscriptions. Flym has a light and dark theme, an option to star articles, filter feeds by keywords, offline reading and custom widgets. Pretty solid for a free/no ads app. Newsfold is a Feedly and Inoreader RSS reader with rich gesture support, full screen reading, dark and light themes, readability support, offline reading. The paid version lets you add multiple accounts (for $2.50). If you ever used Fenix, an Android app for Twitter, you should know the developer is reputable. Adding RSS feeds is easy, navigating is smooth, and the looks are good. Try it. Inoreader is for the RSS readers geeks and power users. Free with ads, or $15 per year with a starter pack for ad-less reading, Inoreader lets you easily add your favorite sources, or simply Google or Twitter searches per specific keywords. Subscribe to social feeds, save stuff for offline reading. Inoreader is cross-platform, so you can use it from different devices and always get the new articles. Categories are available for easy sorting. You can archive your subscriptions. It looks neat, and is user-friendly, so we recommend it for noobs, too. No frills, it’s utilitarian and feature-rich. Discovery Mode lets you find something new if you’re not sure what you need. Group your feeds into handy folders, tag articles, or create more geeky rules to sort your news. You can share news on social networks and with your Inoreader followers. Unlike other apps that allow archiving, Inoreader stores your archives permanently. Flyne is a wonderful RSS reader app if you’re looking into offline reading. 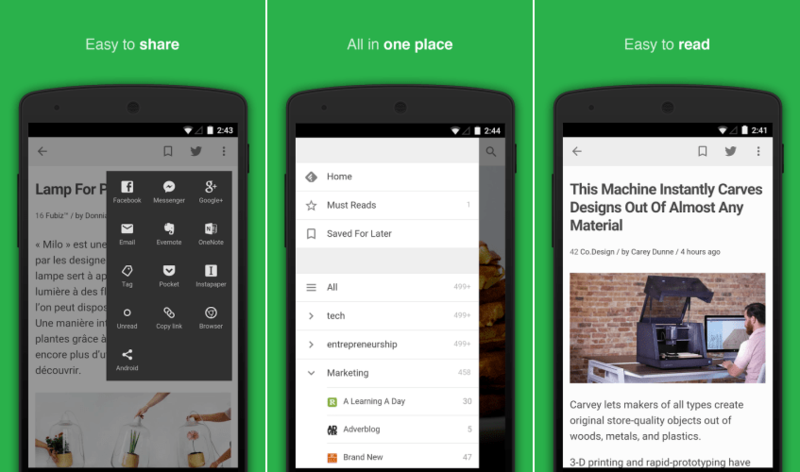 A $2 upgrade to premium lets you add a Feedly account, too. NewsBlur is cross-platform; syncs with the cloud to keep you on the same page on all your devices; lets you read offline, share and comment on the news, take part in the community. It has folders, and a dark mode for night reading. What we like about NewsBlur is its ability to learn from your reading behavior. This might not be evident right from the start, but start hiding the articles you don’t find relevant, and NewsBlur will impress you in a few weeks time with a feed worth of a 5-star review. Try it. It’s free to subscribe to 64 sites, $24 per year for unlimited subscriptions. Feed Wrangler is an iOS-exclusive (and web) RSS reader that’s a long-time favorite of many iOS users. It features clean UI, powerful search, integration with Instapaper and Pocket, and Apple Watch with a glance view to see the latest headlines. The free version puts a limit on your reading, 50 articles at first and then 3 per day. It’s elegant, with its fancy font, sharing tools, smooth gesture-based navigation, full screen reading, and support for Feed Wrangler, Feedbin, Feedly, Fever and NewsBlur. You might have noticed, I skipped Fliboard (because its “smart” UI gives me a headache), so I was looking for a more traditional RSS-like experience. News apps are cool and all that, but there is nothing more omni-directional and productive than an RSS reader app. It’s so much easier to find something relevant in a RSS reader app than in Facebook, Twitter or Flipboard. Really Simple Syndication rules. 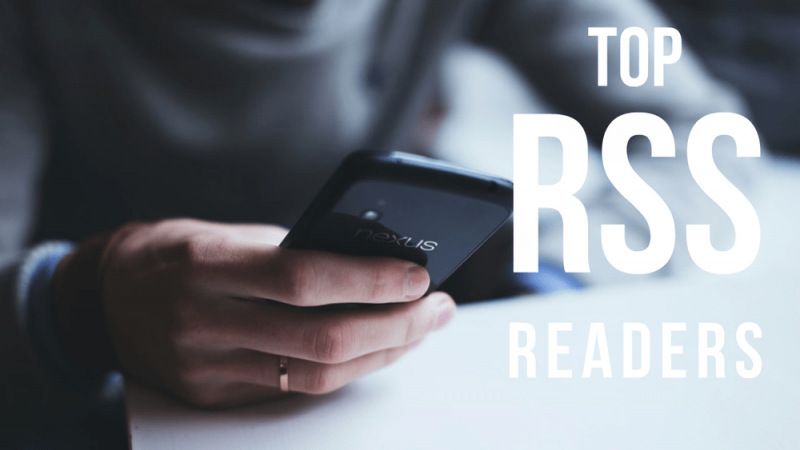 So, how do you tackle your RSS reading challenge? Share your app suggestions in the comments below, and don’t forget to follow PocketMeta for more apps and games roundups, smart guides and reviews.